We eat salmon at least once a week. We’re not keen on it pan fried as that seems to bring out the richness so I either bake it in the oven in a variety of ways, poach it or have it as tartare. This recipe came about one night because we had both a large piece of salmon and some leftover roast vegetables in the fridge. I got held up somewhere, Mike said he could prepare dinner so I invented the dish on the spot while on the phone and Mike added his touch at the end. Heat the oven to 180-200°C. Toss the salmon in the lemon juice and chopped herbs. Season it lightly. 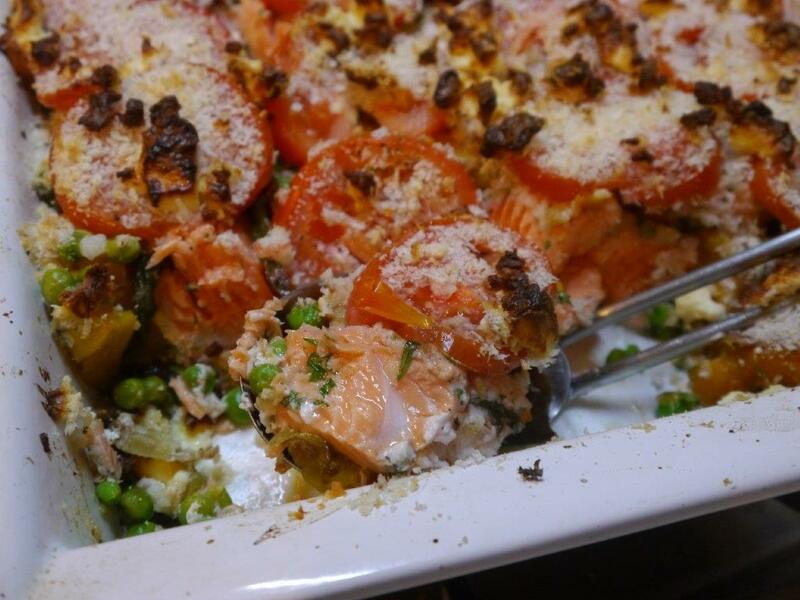 Place the vegetables in a baking dish and put the pieces of salmon amongst the vegetables and peas if using. Season. Cover all with a layer of sliced tomatoes and sprinkle with panko crumbs. Sprinkle with grated cheese or crumbled pieces of a feta or similar. We had a blue cheese and feta in the fridge so Mike used those. Bake for about 15-30 minutes until the salmon is cooked. The cooking time will depend on how large the dish is. You don’t really need to serve this with anything else but if you want to, have a green salad or green beans. We often have salmon tartare when we come home at the end of a weekend’s work – hungry having not eaten lunch and wanting something quick and delicious before dinner. Sometimes I vary things a bit and give a different twist to this classic. Put the salmon in a bowl and add the lemon and lime juice – there needs to be enough juice so the salmon looks moist. Let it sit for a few minutes while you chop the tomato, cucumber and coriander. 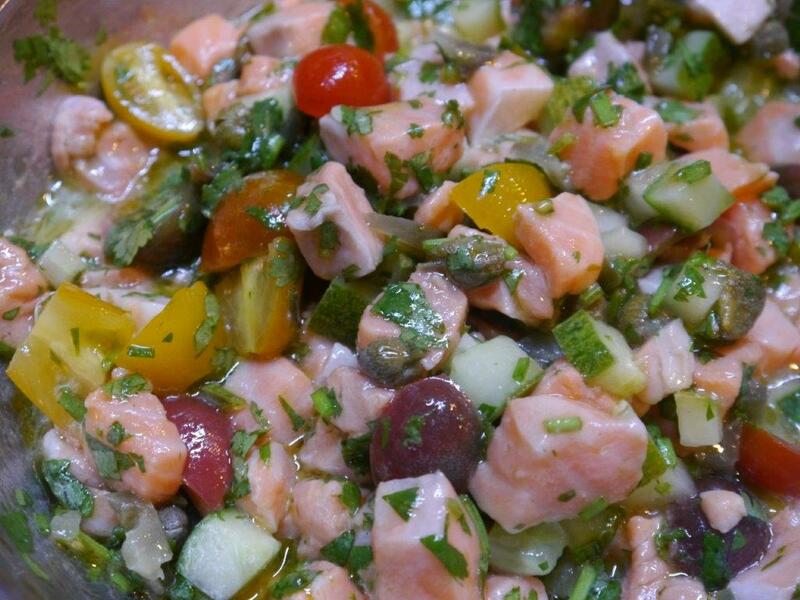 Add these to the salmon together with the jalapeno pieces and capers. Taste and season. Add a little olive oil – use it to balance out the acidity of the lime and lemon juice. Mix gently and it’d ready. Serve with good quality rustic bread. Note: jars of pickled jalapenos are available at supermarkets – they’re not too hot.